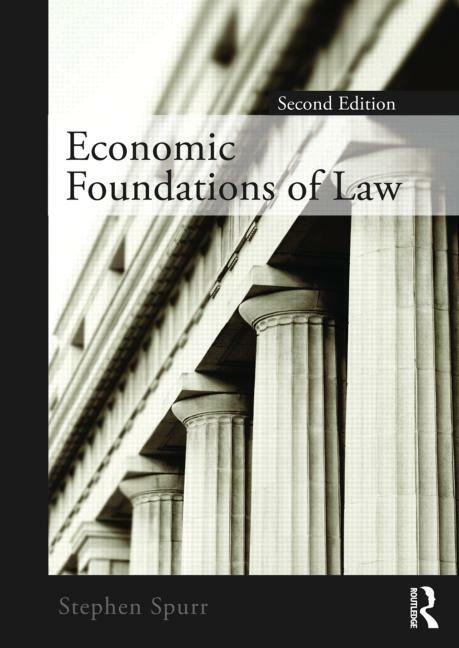 Economic Foundations of Law (2nd ed.) provides an economic analysis of the major areas of the law: property law, torts, contracts, criminal law, civil procedure, corporation law and financial markets, taxation and labor law. In line with current trends in legal scholarship, discussion is focused on economic principles such as risk aversion, efficiency, opportunity cost, moral hazard, rent-seeking behaviour and economies of scale. Accessible, comprehensive and well written, this book uses extensive practical examples and explanations to illustrate key points. There are numerous applications to lawyers and the legal profession, with detailed discussions of subjects as diverse as the proposed market for transplantable human organs, the market for adoptions, the market for bail bonds, the unanticipated effects of Megan’s law, and issues of racial profiling. Fully updated and revised, a new chapter on labor law has also been included. Stephen Spurr is Professor of Economics at Wayne State University, Detroit, USA.